Over a century since scientists first observed that cells and their nuclei grow at a constant ratio to each other, researchers are now closer to finding out how. The cell cycle, the process of cell growth and division that sees daughter cells enlarge before dividing again, and the nucleus simultaneously divides and enlarges hand-in-hand with the cell. The mechanism involved in this in-tandem augmentation has proven one of the great unanswered questions of cell biology—the bigger the cell, the bigger the nucleus, but what controls this proportional enlargement? Assistant Professor Kazunori Kume of Hiroshima University, through his latest research into yeast cells, has discovered that the hoarding of genetic materials (mRNA) and proteins by the nucleus causes it to bulk up. He further proposes that this swelling is enabled by controlling the transport of mRNA and proteins from the nucleus into the encompassing liquid cytoplasm and the amount of nuclear membrane supplied via lipid synthesis. As it is already known that the consistent size ratio between cells and nuclei deviates with age or cancer, it is hoped these new findings could contribute to the understanding of body degeneration and its prevention. Yeast, a single-celled organism, shares many characteristics and a size similar to cells found in humans and other eukaryotes. 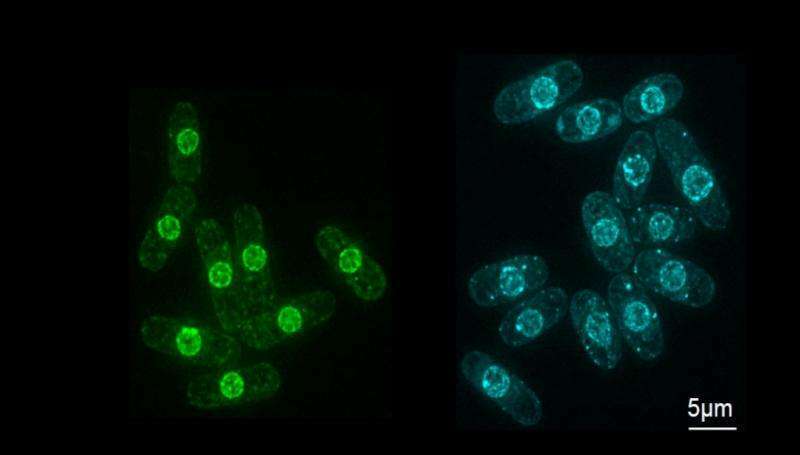 For this latest discovery, Assistant Professor Kume from HU's Research Center for Healthy Aging carried out a comprehensive search of the fission yeast genome in the hope of finding elusive genes that determine nucleus size. Of the 5000 genes found in fission yeast, 2000 are essential for cell growth, so he looked at the other 3000 in the hope that some might be involved in controlling the size of the nucleus instead. Each of these 3000 genes was removed in isolation, and the resultant mutated yeast cell was observed under the microscope. By recording the dimensions of each of the resultant cells and their nuclei, he was able to calculate a cell-to-nucleus ratio—a painstaking process that paid off. He found 14 genes whose deletion led to a greater cell-to-nucleus ratio than the usual 0.08, suggesting they were responsible for this ratio's maintenance. Further investigation into these nuclei showed that the usual mechanisms required for transporting mRNA from inside the nucleus, where it is produced, to the cell's cytoplasm, where it is required for protein production, was defective—meaning the mRNA couldn't get out. mRNA molecules contain genetic information for producing proteins, and true to form, analysis of the larger mutated nuclei showed that they contained not only a higher concentration of mRNA, but also mRNA derived proteins, causing them to swell. This nuclear swelling was also seen to be dependent on lipid production, which is required for nuclear membrane expansion. Interestingly the researchers found that even disruption of lipid production alone deregulated nuclear membrane growth, resulting in an increased nuclear size. While this research shines a light on cell-to-nucleus ratio maintenance, Assistant Professor Kume admits there is still a long way to go before they can fully understand what is occurring: "There are so many questions that now need answering—what triggers these membrane changes? Does nuclear expansion cause cancer or result from it? What causes these specific genes to mutate? This research is just the first step into the unknown. It means I now have leads to follow and more mysteries to solve."